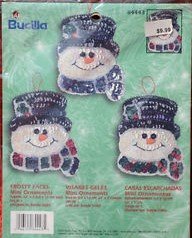 Bucilla Snowman - Frosty Faces - Mini Ornaments - Kit 84443 by Bucilla at Designers Artists. MPN: 84443. Hurry! Limited time offer. Offer valid only while supplies last. Kit contains - stamped felt, cotton floss, color-separated sequins and beads, Magnets, pins, gold-plated needles and tri-lingual instructions. Kit contains - stamped felt, cotton floss, color-separated sequins and beads, Magnets, pins, gold-plated needles and tri-lingual instructions. Finished size about 2½ by 3 inches Designed by Bonnie Smith - can be ornaments or pins! Dated 2001. Use simple applique and embroidery stitches to complete these snowmen measuring 2.5" x 3"